Our motto Try Persevere Achieve forms the basis of the idea that each student is provided with the opportunity at Staughton College to try, develop and grow intellectually, physically and emotionally over their time at the school. Our year 7 – 12, coeducational, single-campus school provides a friendly environment where boys and girls of all ages can learn to live and work together. We value the sense of community among teachers and students alike. Older students and student leaders provide valuable role models for the younger and, in turn, they learn about the responsibilities of adulthood and the skills necessary to contribute positively to the community and the work place. All learn about socially responsible and respectful behaviour, about courtesy, about the way we should treat each other and about accepting responsibility for one's actions. Our Rights and responsibilities are based on respect, learn and safety. The College provides structures to support a transition from Primary school including core rooms and core teachers. Our experience is that it doesn't take long before students feel confident and comfortable at school. This is a very important first step. We also have high expectations of our students' learning. Around those high expectations, we build structure, teaching practice, organisation and procedures. We expect students to take on the challenge of continuously improving upon their learning and participating in the broad range of programs and extra-curricular activities on offer. This is supported by continuous evaluation and improvement of subjects, courses of study, and the way in which teaching and learning occurs. The academic achievements of our students are exemplified by their VCE results, VCAL completion and the tertiary, further education and training pathways they take up after graduation. 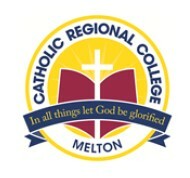 Catholic Regional College, Melton is a 7 – 12 Catholic, Co-educational, Secondary College, situated in Bulmans Road, Melton. It provides education for the Parishes of St Bernard’s Bacchus Marsh, St Dominic’s Melton and St Anthony’s Melton South. The College is part of the Catholic Regional College Federation, which includes campuses at Caroline Springs, North Keilor, St Albans and Sydenham. The College is administered by the Catholic Regional College Council, with Father John O’Reilly as Chairperson, and Mr Mark Sheehan as the Principals’ Representative. The College was officially opened in 1980 with Sister Helen Reed as Principal. Sister Reed was from the order of the Sisters of St Joseph of the Sacred Heart. This order of sisters was founded by Mary MacKillop who was a passionate believer in education for all. Reflecting the Order's habit, our College uniform was initially chocolate brown. In 1990 the new uniform of maroon, gold and navy was gradually phased in. In March 1980, the College relocated from its temporary location at St Dominic’s Parish Hall to its permanent site in Bulmans Road, Melton. In 1982 another junior campus at North Keilor was opened as was the campus at Sydenham. At the end of 1984, Sister Helen Reed completed her term as Principal. In 1985, Mr Frank Fitzgerald began his term as Principal until 1995. In 1996, Mr Paul Daffey commenced in what eventuated as a 13 year period of service.In 2009 Mr Mark Sheehan began his term as Principal. day school with campuses in both Melton and Caroline Springs. focused very much on the future. Campus for Years 7 to 12 is located in the Caroline Springs Town Centre and was opened in July 2005 with stage 2 completed for the start of the 2009 academic school year. Our school motto is ‘Courage, Truth, Compassion’ and is derived from our Patron Saint, Dominic, who demonstrated these virtues throughout his life. We challenge ourselves to show these virtues in our daily lives. The eagle is a pivotal symbol taken from the Bible. We use it to inspire us to strive for excellence and to rise above our challenges.